The number of women applicants to medical school has increased steadily over the past few decades, rising to 50.8% of all American medical school applicants in 2003 to 2004. Despite this increase, women have historically been underrepresented across some medical fields when compared with men. Studies indicate that academic faculty women comprise a large percentage of primary care specialties, but only about 15% of faculty in general surgery are women. 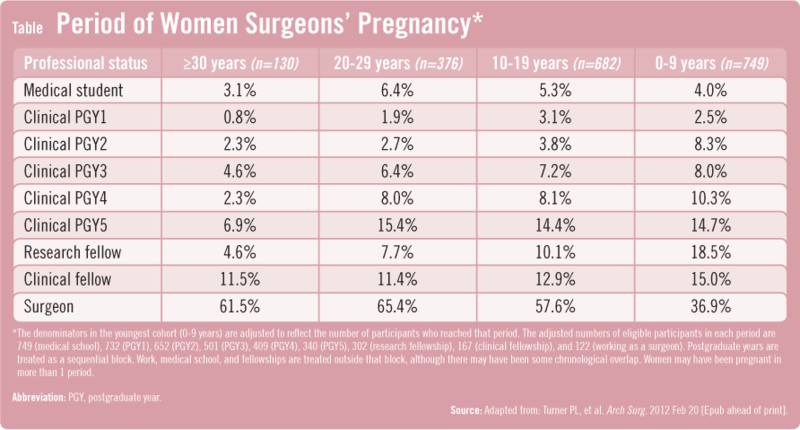 Data from 2008 demonstrated that women represented just 32.3% of residents in general surgery. While the number of women medical students pursuing a career in surgery has increased steadily since 1997, there are still disproportionately fewer women than men pursuing general surgery and surgical subspecialties. 0 to 9 years since graduation. 10 to 19 years since graduation. 20 to 29 years since graduation. 30 or more years since graduation. “Not surprisingly, women who trained in an earlier period were less likely to have been pregnant during training than their younger counterparts,” says Dr. Turner. “In general, most women in our study deferred pregnancy until after their training was completed. However, more of the recent graduates had pregnancies during residency training.” During fellowship, the frequency of pregnancies increased in all study groups assessed. The most likely time for women to have been pregnant was while working as a surgeon after the completion of training. As the length of time after completion of residency training increased, the relative number of women becoming pregnant also generally increased (Table). Turner PL, Lumpkins K, Gabre J, et al. Pregnancy among women surgeons: trends over time. Arch Surg. 2012 Feb 20 [Epub ahead of print]. Available at: http://archsurg.ama-assn.org/cgi/reprint/archsurg.2011.1693. Straehley CJ, Longo P. Family issues affecting women in medicine, particularly women surgeons. Am J Surg. 2006;192:695-698. Willett LL, Wellons MF, Hartig JR; et al. 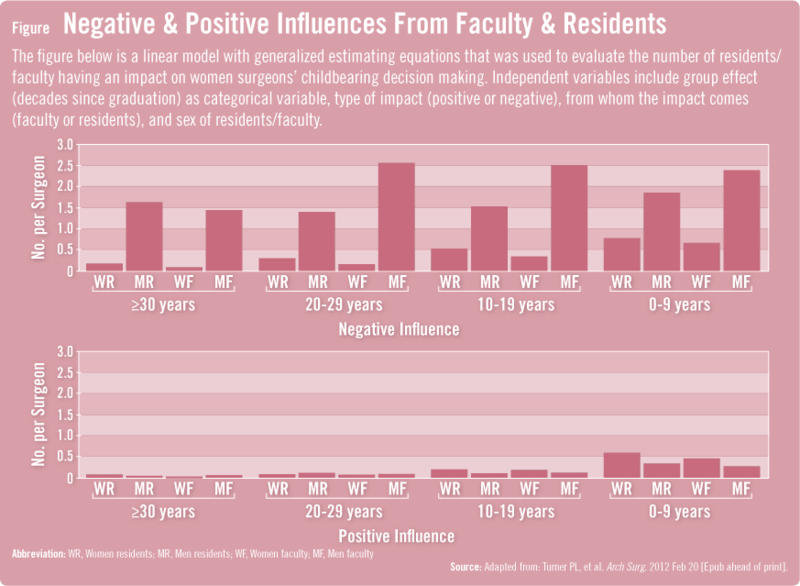 Do women residents delay childbearing due to perceived career threats? Acad Med. 2010;85:640-646. Finch SJ. Pregnancy during residency: a literature review. Acad Med. 2003;78:418-428. Davis EC, Risucci DA, Blair PG, Sachdeva AK. Women in surgery residency programs: evolving trends from a national perspective. J Am Coll Surg. 2011;212:320-326. Snyder RA, Bills JL, Phillips SE, et al. Specific interventions to increase women’s interest in surgery. J Am Coll Surg. 2008;207:942-947,947,e1-e8. Troppmann KM, Palis BE, Goodnight JE Jr, et al. Women surgeons in the new millennium. Arch Surg. 2009;144:635-642. Patricia L. Turner, MD, FACS, has indicated to Physician’s Weekly that she has worked as a consultant for Ethicon and Covidien, and has served as a paid speaker for Ethicon, and Gore.